I think I may have to sit out Virigin Galactic's 200k ride into space with their soon-to-launch (fingers crossed) SpaceshipTwo. However, there are other contenders for your retirement money in this arena, and some of them, while offering less head-room and fewer amenities, promise to be slightly less expensive. 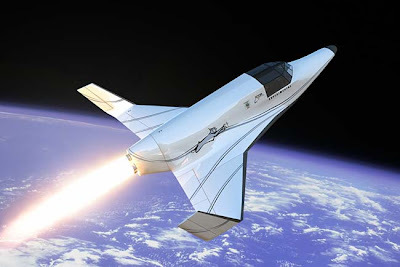 The one I'm most jazzed about right now is the Lynx spacecraft by XCOR. You can download the podcast from the Planetary Society where they talk about the ship here. And here's a link to an article describing the Lynx. Just you and pilot fly, you in the co-pilot's seat. Sounds fabulous. Wow, I just watched NASA TV as the Phoenix lander touched down on the northern plains of Mars, while also monitoring a planetary society chat room (elakdawalla's Ustream page) with a bunch of fellow enthusiasts. It was awesome, especially because the spacecraft landed safely! The last three successful landings used airbags for a bounce landing. This one was like the earlier Viking landings in the 70s, using thrusters for the last hundred or so meters. Very cool stuff. Looking forward to digging down into the ice and seeing if anything like earth life has ever lived on mars! I'm very excited to see positive reviews for Keep on the Shadowfell hitting the net. Here's one from gamingsteve.com. If you're interested in trying out 4th Edition D&D before the full rules are published next month, why not try this module? Not only does it provide quick start rules for the game, it is the first in a series of loosely connected modules. 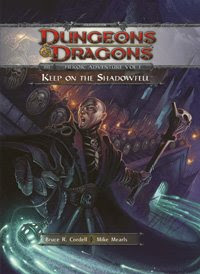 Though not required to have played any previous module to enjoy a later adventure, discerning DMs will have the opportunity to pick up storylines in later modules that first debuted in Keep on the Shadowfell. The module comes with a comprehensive set of quick-start rules for both the players as well as the DM (the DM rules are more comprehensive and cover more topics, as you would expect with a ruleset for DMs). If you are familiar with D&D and the rules to 3.5, then picking up 4th Edition should be a piece of cake. I scribed an introduction to one of the new features of the 4th edition rules: Epic Destinies. As it turns out, I was the the one who actually wrote a lot of the story text that appears, in edited form, in the three epic destines that made it into the PHB. So my introduction of epic destinies on DDi seems somehow appropriate. While it’s true that your epic destiny allows you to bend, break, or ignore some of the laws of the universe, an epic destiny isn’t merely about acquiring even more power. [It is is more about] defining your place in the universe. Your epic destiny is the mythic archetype your character aspires to achieve. Once you reach 21st level, the greatness you always knew you were destined for is no longer theoretical; it is actual. Head over to DDI to see the complete (though unformatted) archmage epic destiny. 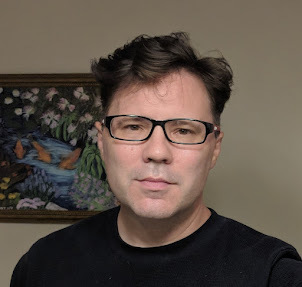 I and my coauthor Mike Mearls were interviewed about the soon-to-be published first 4th Edition product, Keep on the Shadowfell, here at Wizards' site. Wizards: As the title is Keep on the "Shadowfell", what can you tell us about Shadowfell? I noticed Expelled was playing at my local Movie Theater. I can't let this slip past without commenting. If you followed the Dover trial a few years ago, you know that Intelligent Design was exposed as rank Creationism, and worse, those trying to argue Intelligent Design was somehow science knew full well their claim wasn't true, but they were willing to lie to get their way ("their way" being the teaching of ID in science class as if actual science). Well, the Discovery Institute's shaded truths are back, this time in the guise of a movie that is apparently seeing wide release. A great place to learn more about this movie is a website created and maintained by the National Center for Science Education: ExpelledExposed.Com. ExpelledExposed clearly reveals "why this movie is not a documentary at all, but anti-science propaganda aimed at creating the appearance of controversy where there is none." I recommend clicking through a few links at ExpelledExposed, then go catch the movie with friends. 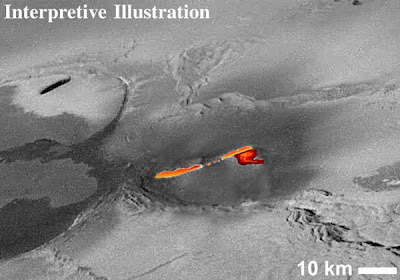 Lava fountains on the moon Io, that is, which orbits Jupiter. How amazing is it that a craft we built and launched into the lifeless void in 13 years ago is still sending back photos of violent lava fountains on another world? It's freaking amazing when you think about it. I thought you had to put one of your products into consideration for an Origins nomination? I haven't put any forward for consideration for years... so I was surprised when Google told me today that one of the Dungeon Tiles product packs I designed is nominated in the Roleplaying Game Supplement category. What? But,... Yay! Dungeon Tiles are a game aid, not a supplement in the traditional sense, so I don't expect I'll win the category. But, it's cool to find I'm nominated, assuming this page is correct. Of course, while I designed the set, the artists who turned my crude pencil markings into actual dungeon tiles deserve more credit.